Kindermusik@School is a research-based language and early literacy program built around music. 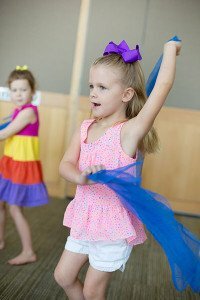 This class helps 2-6 year-olds develop pre-literacy and language skills through a child’s most-loved rituals: music and story time. Kindermusik@School supports the early childhood standards and requirements for “high quality programs” as defined by the National Institute for Early Education. Plus for the older age group, this class aligns with pre-K national and state standards. Every one of Kindermusik@School’s lessons is a tightly crafted sequence of songs, stories, and focused listening activities that engage students of every learning style and across multiple learning domains. And with a special focus on listening skills and response to auditory cues, the program strengthens cognitive connections, receptive and expressive language skills, and even social skills such as turn-taking and self-regulation. New music and activities at home every 4 weeks: CD + magazine-style book every month, plus an instrument every other month.